President Donald Trump listens to questions from the media after speaking with members of the military by video conference on Christmas Day, Tuesday, Dec. 25, 2018, in the Oval Office of the White House. Characteristically, President Donald Trump responded to bad news on Christmas Eve by blaming others. As battered markets slumped again, he faulted the Federal Reserve. "The only problem our economy has is the Fed," the president declared of the central bank chaired by his appointee Jerome Powell. Yet simply by making the assertion, Trump negated it. The end of 2018 makes clearer every day that the president himself represents a fundamental problem for America's economy and national security alike. Trump's erratic behavior and weak leadership have unsettled Wall Street and Washington alike — and there's every reason to expect things will get worse. For much of the president's tenure so far, surging stock prices created an aura of economic well-being that made his conduct appear to be a sort of entertainment. After Trump and congressional Republicans passed a large, deficit-financed tax cut one year ago, an uptick in growth bolstered confidence even more. But now shifting political and economic winds have placed the president's leadership under a harsher spotlight. The image is not reassuring. Economic growth, which hit 4.2 percent in the second quarter, has already slowed. Forecasters predict it will keep slowing in 2019 as stimulus from tax cuts and spending increases wanes, with recession a rising possibility for 2020. The administration's chaotic approach to trade conflicts — threatening deeper tariffs, then backing off for negotiations, then threatening again — has deepened uncertainty about the economic outlook. So have his reported musings about firing Powell. In response, Trump's inexperienced Treasury secretary, Steven Mnuchin, undertook weekend cleanup efforts that appeared to damage rather than bolster market sentiment. Stock markets remain on track for the worst year since the 2008 financial crisis and the worst December ever. Turmoil at the highest level of the administration intensifies the unease. After striking a deal with GOP leaders on an end-of-year funding plan, Trump reversed course under criticism from far-right Republican politicians and media personalities and triggered a partial government shutdown. His impulsive order of immediate troop withdrawals from Syria — over objections from top advisors — alarmed national security experts across the spectrum. Defense Secretary James Mattis, the foremost calming influence on his team, resigned while signaling he doubts Trump's commitment to defending American interests. Then the top White House aide leading the fight against ISIS quit. Trump has an acting chief of staff and acting attorney general after firing both of their predecessors. January promises to be even rockier. Democrats assume control of the House with power to roadblock Trump's agenda and scrutinize his actions. Robert Mueller's special counsel probe — which has already ensnared the president's personal lawyer, campaign chairman and first national security advisor — draws ever closer to Trump himself. Trump's family business, his charitable foundation, his 2016 campaign and his actions as president all face active criminal investigations. With impeachment talk getting louder, presidential historian Robert Dallek recalls Richard Nixon's downward spiral from Watergate. Nixon fell not because of his political enemies but because of his own ethical and temperamental shortcomings. "One sees something similar with Donald Trump," Dallek told me. "He's a man of bad character." In an era before cable news and social media, Nixon vented largely in private. As if investors or diplomats need more to worry about, Trump puts his embattled psyche on display even without public appearances. Rather than performing traditional presidential duties, Trump watches television in the White House residence and vents at critics on Twitter. Always disclaiming responsibility for problems, he strikes out one moment at congressional Republicans, the next at the Fed, then at Mattis. 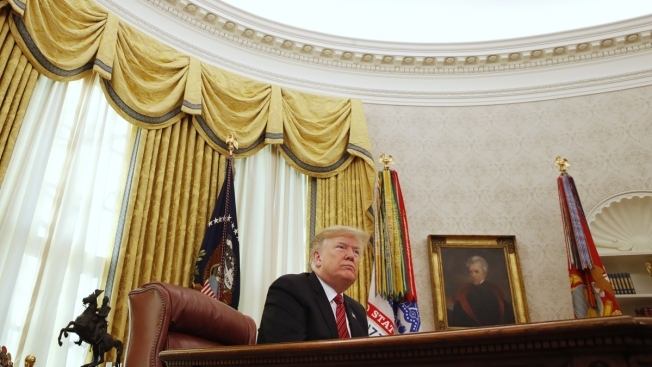 "I am all alone (poor me) in the White House waiting for the Democrats to come back and make a deal on desperately needed border security," Trump tweeted shortly after noon on Christmas Eve. "At some point the Democrats not wanting to make a deal will cost our country more money than the Border Wall we are all talking about," the president continued. "Crazy!"